Clear your paper clutter in time for the holidays and beat identity theft at the same time! Visit the Marshall County Recycle Depot on December 2, 2015, from 8:00 – 12 noon for the Grateful Shred, the Marshall County Solid Waste District’s annual shredding event in partnership with Integra Certified Document Shredding and Destruction Services. 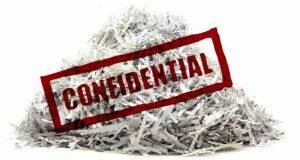 Any Marshall County resident can bring their confidential documents and records for shredding on site. Up to 100 pounds per person will be shredded free of charge. Anything over that amount will cost $.15 a pound. The Depot asks the public to bring confidential papers only and to make sure all records are free of plastic and metal. Please: no ring binders, large binder clips, magazines, or trash. The Depot will also be open that morning for recycling and household hazardous waste disposal. Declutter your home office or clean out a filing cabinet, and prevent identity theft by shredding your personal documents! The Marshall County Recycle Depot is located at 1900 Walter Glaub Drive, Plymouth, Indiana. For more information, call Director Marianne Peters at (574) 935-8618.